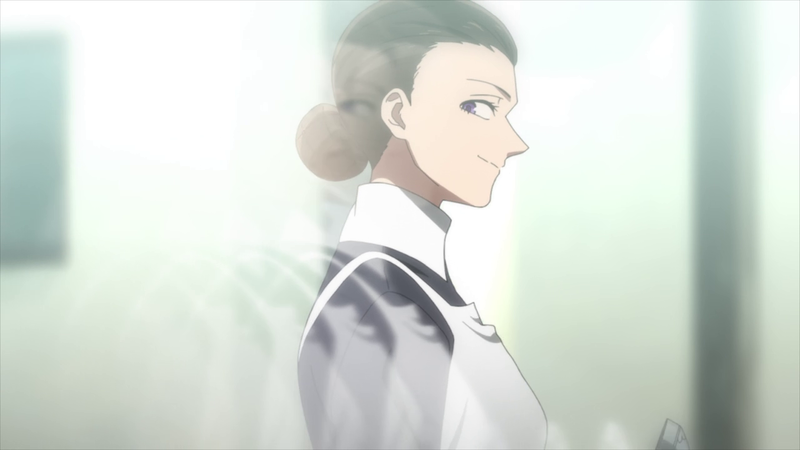 Since the series’ second episode, The Promised Neverland had settled into a pattern. 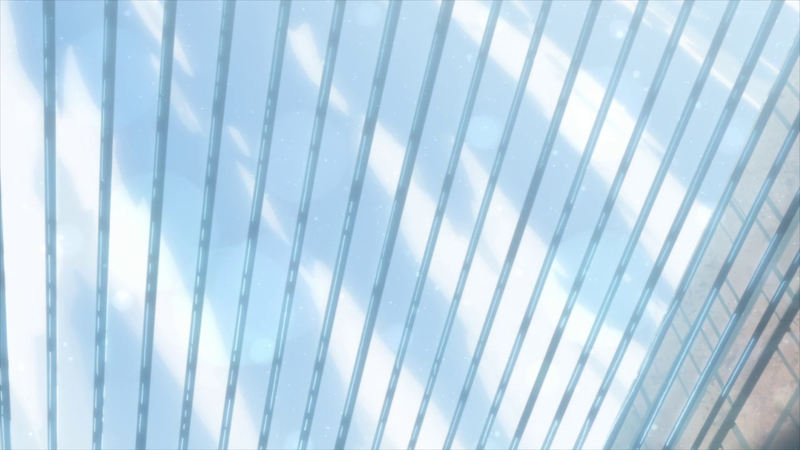 Episode 8 broke that pattern, visually, aurally, and narratively. Despite ongoing tension and periods of heightened excitement or fear, there was an unspoken understanding that everything was moving forward fairly unhindered. Challenges were placed in front of the children — like Ray’s role as Mom Isabella’s spy, the main trio of Norman, Emma, and Ray’s misunderstanding and lack of communication with Don and Gilda, or Sister Krone’s discovery of their escape plans — but at the end of each episode, even if it was a small cliffhanger, the action progressed. The children continued to plot their escape from Grace Field House. Emma’s leg break, a masterful move from Isabella (and by her own hands, no less) shatters this idea of moving forward. With the gristly cracking sound — the brutality of the action itself is shown offscreen — the children’s plans are, at the very least, significantly altered, if not halted altogether. This shift is present throughout the entire episode which is off-balance for its entirety. 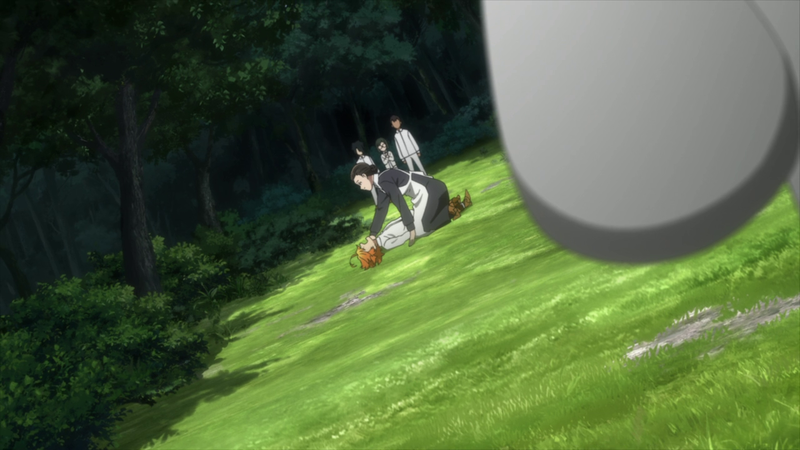 It begins with Sister Krone, whose expected demise is supplemented by shots like the one above. Grace Field House’s main gate in the background becomes a guillotine, making it clear that Krone’s death is imminent. The ground is slightly at an angle, placing everything off-balance. Krone bought into the system, presumably did everything that was asked of her, and yet when she reports on Isabella’s rule-breaking, is told that none of it matters. Then she is killed. The ground shifts. This shot is revisited with Isabella’s betrayal of Ray. Ray assumed that he had Isabella well in hand, even after he decided to turn on her and report to Norman and Emma. 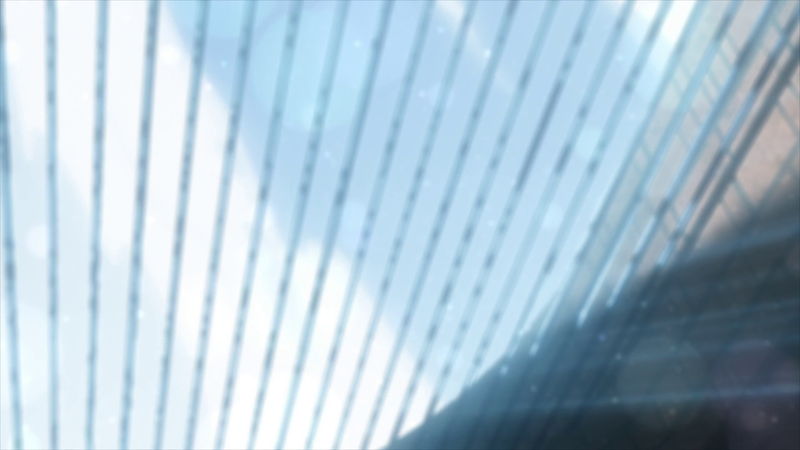 Here, Isabella looms over him in a shot that mirrors Krone’s realization prior to her death. Ray realizes that he no longer has any power over Isabella, and possibly never did. The ground shifts again. 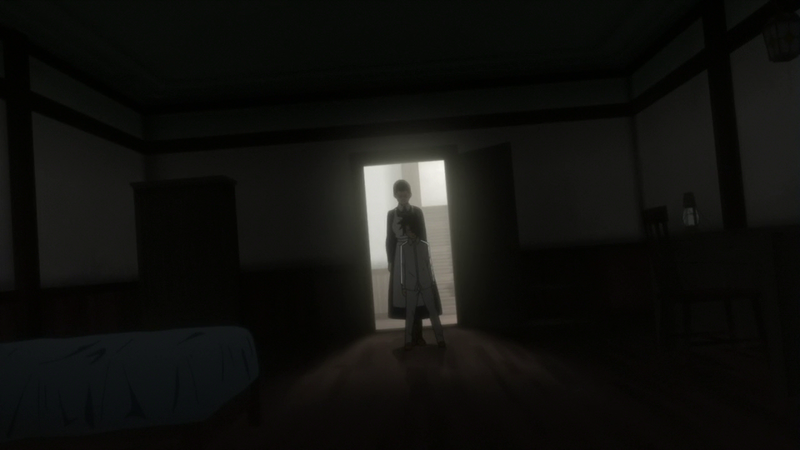 Isabella punctuates this scene by physically shoving Ray into the room and locking the door, telling him that his plans and reports no longer matter. This preys on Ray’s entire self. It’s not simply that he’s now unable to stop Isabella en route to catching Emma and Norman, but that he also valued the information and (in his mind) symbiotic relationship he had with Isabella from providing her information. He wasn’t like the other Grace Field House kids, he was special and received certain privileges for being special. The ground shifts most dramatically after Isabella breaks Emma’s leg. With that one action, she attacks both Emma (whose physical strength is a key part of her sense of self) and Norman (whose courage comes from Emma’s mental fortitude). An incapacitated Emma is as much of a liability as the youngest child, not to mention that Isabella carrying a defeated Emma in her arms is a purposeful show of Isabella’s strength. Even to the children uninformed about Isabella or the nature of their situation, this intentionally reiterates to them that Isabella is in charge, and even visually frames it as an act of a caring, considerate mother. When the ground shifts here, it shifts at the angle at which Emma’s leg was broken before fading and swirling in transition. 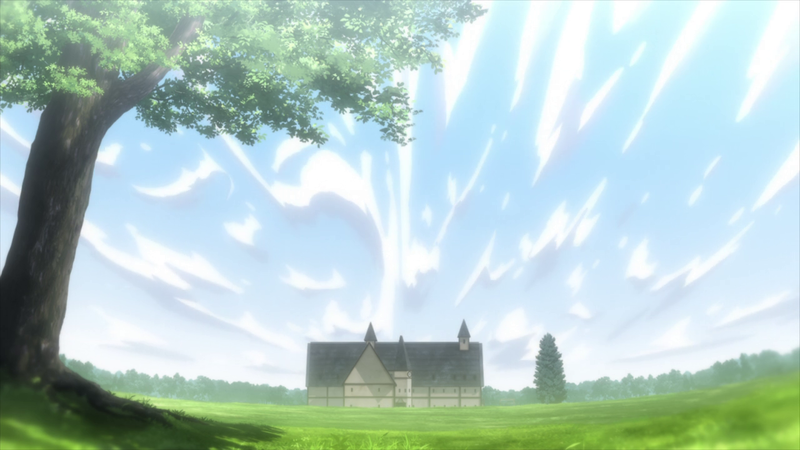 Earlier in the episode, a similar fade out of focus was used as clouds moved over the gate and Krone as she died. The clouds themselves passed by rapidly, almost as if to mark a significant passage of time. Audio choices are important additions to the surrealistic setting and include the children eating as Krone is killed — capping off her death with a “Thank you that was delicious!” — and a jazzy number as Isabella blurs past Don and Gilda, letting them know that their plan has been, in some way, foiled. 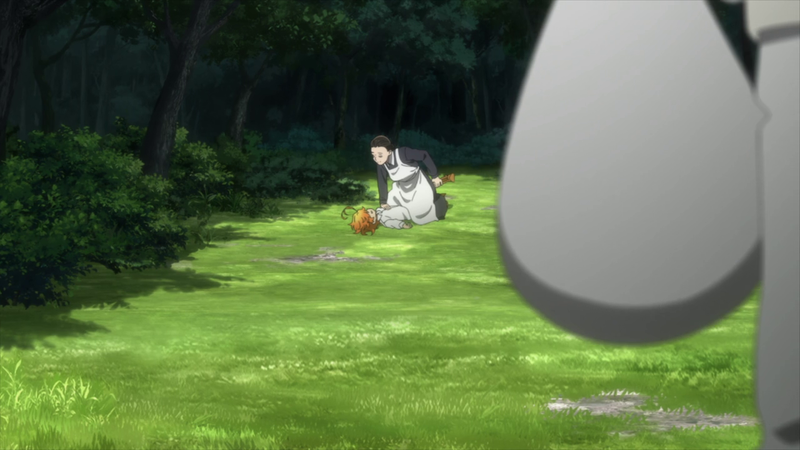 Due to these directorial choices, the effect is that this entire episode seems to take place out of time with the rest of The Promised Neverland anime. It’s almost otherworldly, and at the end, leaves both the children and the viewer reeling. All of these choices serve to separate this episode from the rest. A large part of this episode’s visuals break down the assumptions of each character piece by piece. Krone thought if she bought into the system, she would eventually be rewarded. Instead it bought her only a small amount of time before her death, fraught with worry about competing against other Mom candidates and, eventually, Isabella. Ray thought he was special for reporting to Isabella. Instead, he was another tool in her arsenal. Norman thought that Emma would always be healthy and a driving force of his own courage. Emma thought that she would be able to use her physical prowess to solve a problem in the moment. Additionally, Emma likely never thought that Isabella would go as far as to break her leg, and there’s definitely a part of Emma that still wants to believe that Isabella isn’t “bad,” if not has a side that’s genuinely like the loving mom she grew up with. More than a physical break, it’s an emotional one that severs Emma’s last hopes that Isabella could be caring. This episode tells us through visuals and audio cues that everything will be changed going forward, and then breaks a settled pattern of puzzles — albeit with large amounts of tension and a lack of information — for the children to solve with a large roadblock made up of several smaller obstacles. There were some really great moments with the direction and visuals in this episode, though I found the actual moment of Krone’s death a little messy. 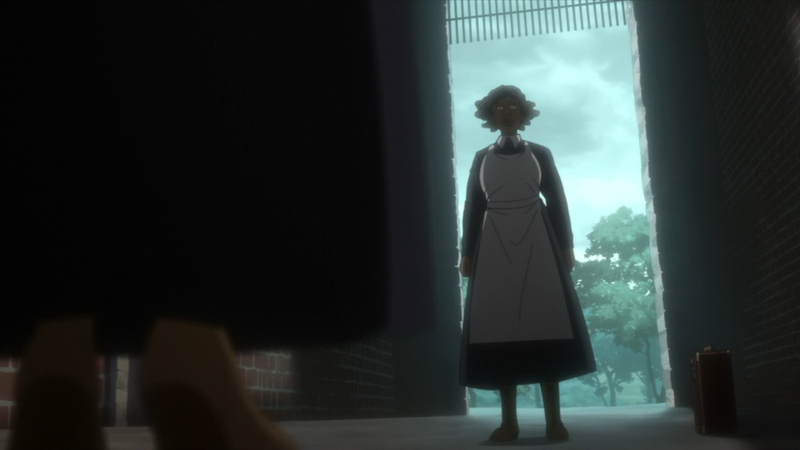 The lead up visuals, particularly mirroring Connie’s walk to the gate from episode 1, were really well done, and was the initial shot where Krone confronted Grandma in front of the gate. 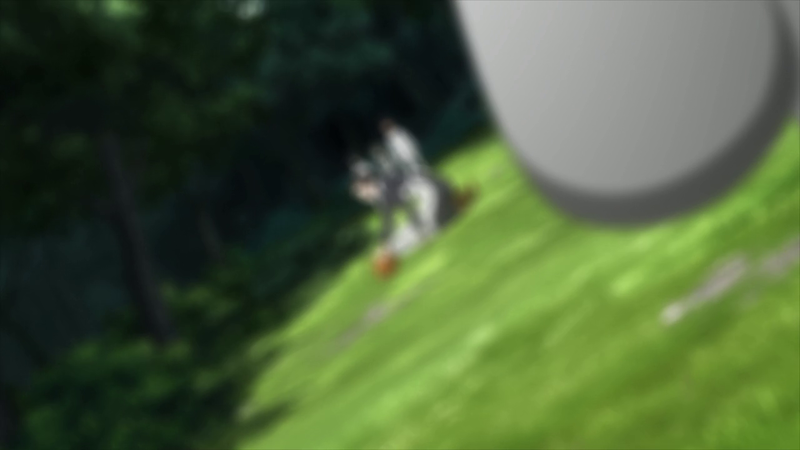 However, once the demon attacked her the scene didn’t make a lot of sense as Krone seemed to move closer and further from the gate without logic and I couldn’t really put the scene together with the way it was shown. The rest of the episode was really nicely done though and I really enjoyed reading your view on how the visuals are framing the characters. Ray in particular was quite interesting in this episode.